Media Studies: Ideas | LockThatDoor. The Bergsonist theoretical aim of Chapter 1 as listed on the handy chart just a page before its beginning is “To liberate the body from its strict correlation with the image.” This chapter addresses the “newness” of “new media.” Mark Hansen realizes that the discussion in the field is limited to two opposite opinions – there usually seems to be no grey area. There are those who believe that new media is truly radical and novel, while the others are more of the glass-half-empty type, who have a hard time believing that new media is actually offering anything “new” as the nomenclature claims. Right away, we realize that Hansen does believe that there is something new going on with digital art. He is using the “vocation” of Bergson, who is concerned with the relationship of the physical human body to art. Digitization complicates the relationship between art and the body. Staring at a painting is much different than navigating a database installation artwork. As the media becomes increasingly multi-faceted and less specific in its form, the body has more options in interacting with it. We no longer just look. We click, listen, watch carefully, etc. Information is made perceivable. The body is more involved “as a selective processor of information.” Along with having many choices within a digital piece of art, the body can also choose to ignore certain aspects of the work. Another thing that often happens is that the body (user) can try to break the piece of digital art by finding its technical flaws. This is not usually possible in more traditional pieces. Paintings are kept behind glass or velvet ropes. Sculptures often have museum guards. It is not in our social behavior vocabulary to physically interact with the more traditional media. We could start doing this, but we might get arrested. Even digital video is interactive. We choose to press play; we can pause, rewind, or stop watching after 30 seconds. What actually makes new media “new” is also the fact that the “flexibility brought by digitization” provides an opportunity for the body to dictate the limitations as opposed to the medium itself. I would like to state that my own beliefs tend to lie on the spectrum of “nothing is new” if only for the fact that as humans we have been creating for a plethora of years. Any kind of art is based on the human experience, and we are all human. So, really, nothing can actually be “new.” However, I do see how, with the advance of technology that did not exist years ago, our interactions with our own human experiences can definitely be argued to be “new.” This seems to be what Hansen is referencing. The possibilities that the digitization of art provides us are almost infinite, but the feelings and statements being expressed are finite. There are only so many emotions or statements we as humans ever really express. What we think are complex emotions or statements can usually be boiled down into a few basics. 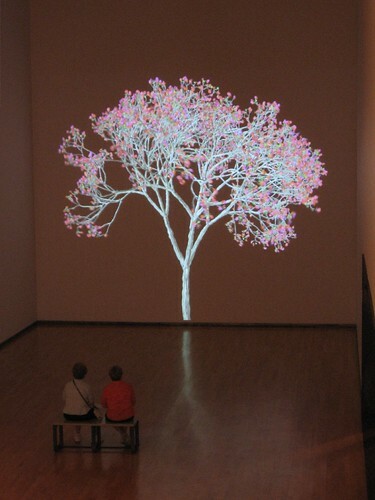 Moving images in digital media, such as in James Coleman’s film installation, are closely linked to the body and, more specifically, the body’s pulse. It is hard not to automatically relate the movement of an image and/or sounds to the rhythms of our own bodies, the blood flowing through our veins to the beat of our hearts. Digital media definitely has something “new” to offer in this sense. There are so many choices for the artist to make, and all of these choices – just by the nature of the digital medium – affect our bodies as we engage with the material. We see a painting with our eyes. We may notice our body while we are viewing – our leg may hurt from an earlier incident, we may be tired – but probably not in relation to the artwork. When we watch a video installation or listen to an audio piece, there is movement. We are more apt to noticing the quickening of our hearts, or that the piece matches the rhythm of our hearts. Not every installation or digital artwork is as blatantly pulsatile, but on some level digital art always relates to bodies differently than just a surface image. But by our continuing to write in foreign languages, paying homage to them, are we not on the cultural level continuing that neo-colonial slavish and cringing spirit? What is the difference between a politician who says Africa cannot do without imperialism and the writer who says Africa cannot do without European languages? Thiong’O used to be of the group of African writers who wrote of the African experience in English. He called out these writers as a part of the Afro-European literary tradition. After much contemplation, he saw a flaw in his own writing in English when it came to fighting against European neo-colonialism. By writing in English, he claims, he was excluding the African peasantry and working class, which is an integral population when it comes to uniting against colonialism. Only the privileged were educated and able to learn English. On top of that, there was no hope in school to try and write in one’s own native language. Under imperialism, these African languages were viewed as backwards and underdeveloped. Under this system, of course they were! If no one is “allowed” or encouraged to speak it, there is no way the language could develop. Students were humiliated with negative reinforcement whenever they spoke or wrote in their mother tongues. They were even encouraged to rat each other out if caught disobeying this rule. The schools were run by Europeans who were attempting to quell any kind of unity, pride, or revolutionary inclination in the African student, thus reaffirming the “white” way of life as more advanced and preferable. The students learned nothing of their own heritage or cultural tradition and were forced to think about their lives in the context of European literature and religion. As a result, these students grew up with a Euro-centric worldview that pushed aside the relevance and importance of Africa and its traditions. All of this was aimed at the continuing neo-colonial control. In his eyes, the African language should most certainly be used as a political technology for breaking away from the neo-colonialism that was subjugating and killing African culture. Some kind of universal native language was an extremely important part of the continuation and development of the African culture. Only after one understood and felt comfortable with his or her own language and natural environment could he or she “enjoy the positive, democratic and revolutionary element in other people’s literatures and cultures without any complexes about his own language, his own self, his environment.” This makes sense. By knowing the significance of one’s own history and culture, one could begin to access others’. A frame of reference is usually needed when absorbing other people’s ways of life. How can one make sense of other worlds if one knows nothing about his own world? Thiong’O sought to rise above “colonial alienation” which resulted in the ignorance or separation between a person and his or her own reality and replaced it with identification with, “that which is most external to one’s own environment.” The most amusing example of this is when Thiong’O wrote about asking students to take characters from Jane Austen’s novels and relate them to their own acquaintances. If someone is already well aware of his or her own culture this could be a useful and poignant exercise. However, according to Thiong’O, this was not the case when they were unaware of their own heritage and thus did not have a basis with which to compare anything. It then became an exercise of shoving one’s life into the mold of a foreign culture as if it was supposed to fit perfectly. The students were forced to function as if Jane Austen’s characters and cultural tradition were part of the African student’s natural environment (as opposed to viewing the assignment as a complex comparative mental exercise of two different cultures). If the students could not complete this task, they were most likely made to feel inferior. It makes complete sense that a true African literature would need to be written in an African language. How else could the full African experience be expressed but with the rhythms and traditions of the mother tongue? It is also true, however, that it was useful for Africans to employ English in their writing. It served as a kind of reclaiming of the African identity under imperialism. It could be interpreted as a way of saying, “Look, we can express ourselves and be heard in your language, too!” These writers were sharing – to the best of their ability – the African experience in a language that would hopefully be noticed and understood at least somewhat by the very English speakers who were repressing them. Welcome to my Spring 2012 semester! This semester I’m taking Media Studies: Ideas and Documentary Research Methods, both of which are already proving to be pretty useful in the production of my Connie Converse project and in the expansion of my media-making mind. Last week my Ideas class had a discussion about Marshall McLuhan and his famous concept, “The Medium is the Message.” I am interested in theory, but that does not mean I know much of anything about it. I am pretty terrible about openly arguing my Ideas and ideals in public. Situations arise in which I am forced (or I volunteer) to give an opinion or make a statement about theory, and I freeze up most of the time. Even if I’ve read the piece a million times and have opinions about it, I can never seem to defend them or explain them articulately. I’m hoping this class forces me out of this awful, uncomfortable shell of intellectual insecurity. I took a big leap tonight and actually posted on my class blog about Mr. McLuhan. The medium is the message in a sense, yes. When you choose to produce something, just by choosing the medium through which you are going to distribute your message, that’s an argument in itself. Your choice is an argument or message ABOUT the kind of message (content) you are trying to share. Whether you choose to make a film, draw a picture, write a paper, play a song, sing, do a dance, produce a radio piece, etc., there are so many implicit and explicit factors that come as a result. For example, let’s say someone wanted to somehow review an album of music. That person could do this in any number of ways: write a short article, write a longer piece, create an audio piece, make a video of themselves, or even paint something, etc. The choice that person makes says a lot about what they think is important/what they want to emphasize about the music. Do they play some clips from the album in their radio piece? Do they transcribe lyrics in the article? We are in a sense limited by whatever medium we choose and we are limited by how that medium affects the receivers of your message. However, that’s just a part of it. Once you actually employ the medium you are constructing the rest of the message and putting in your own spin/content. Once someone starts experimenting with different media and tries to “use” them in “different” ways, that complicates the situation – and makes it more interesting, as well! I’m hoping no super-smart theoretical geniuses pick apart every word and blow my humble opinion completely out of the water. If they do, I will try and make some kind of incredibly charming and well-researched counterpoint. Or maybe I’ll just pretend I didn’t see it.